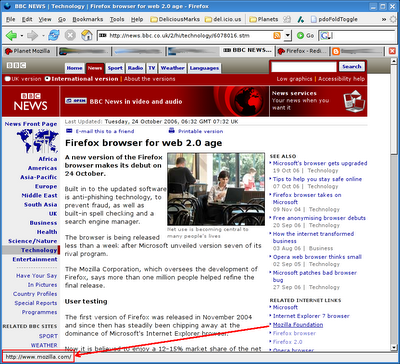 Haa, BBC is also reporting that Firefox 2.0 has been released. Their ticker on the top says: "LATEST: A new version of popular web browser Firefox is launched". The link sends the user to the news items saying Firefox 2.0 debuts on 24Oct. Plus BBC has a link on the right side with the text "Mozilla Foundation" but the link goes to Mozilla Corporation website. The image below shows the target link on the status bar when the mouse is hovered over Mozilla Foundation hypertext. So much for the release confusion that this post is named "Mozilla Consfusdation™".